Nice ad from Sears Roebuck in 1934. An interesting write-up and ad from D&M circa 1916. 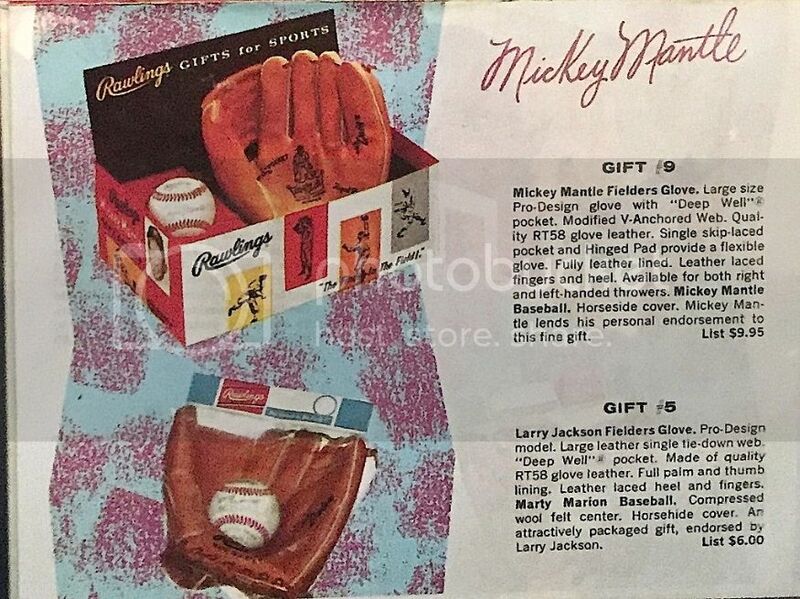 Just finding a Joe Jackson mitt would be great. The whole vendor display package is awesome. One of Harry Latina's innovative designs. 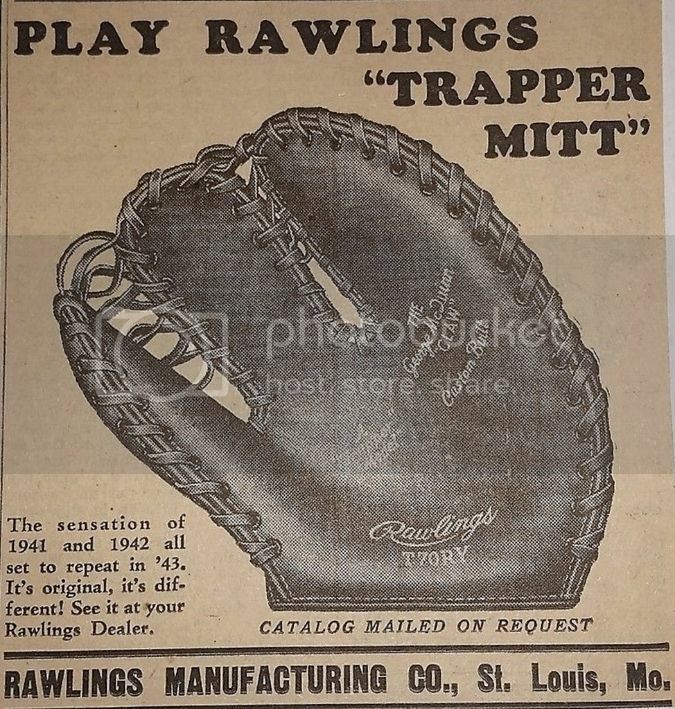 The "McGuinn" mitt was a mainstay among MLB palyers. 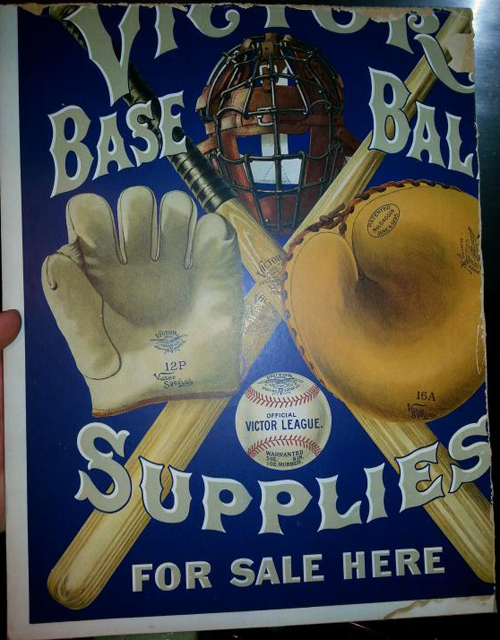 Here is the D&M ad from 1922 I referred to in another post regarding an auction of a G41 glove on ebay. 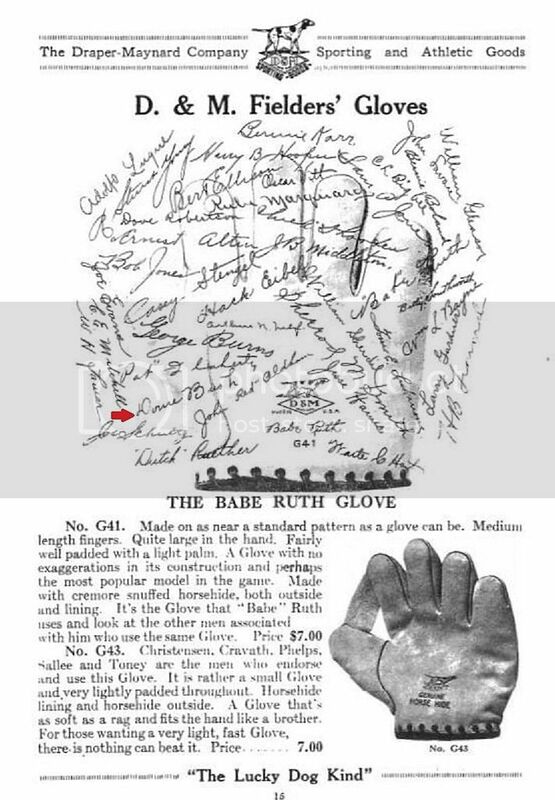 This ad depicts the G41 "Babe Ruth" glove with various endorser's autographs overlaying the glove image. "Donie Bush" is present along with dozens of other stars of the day. 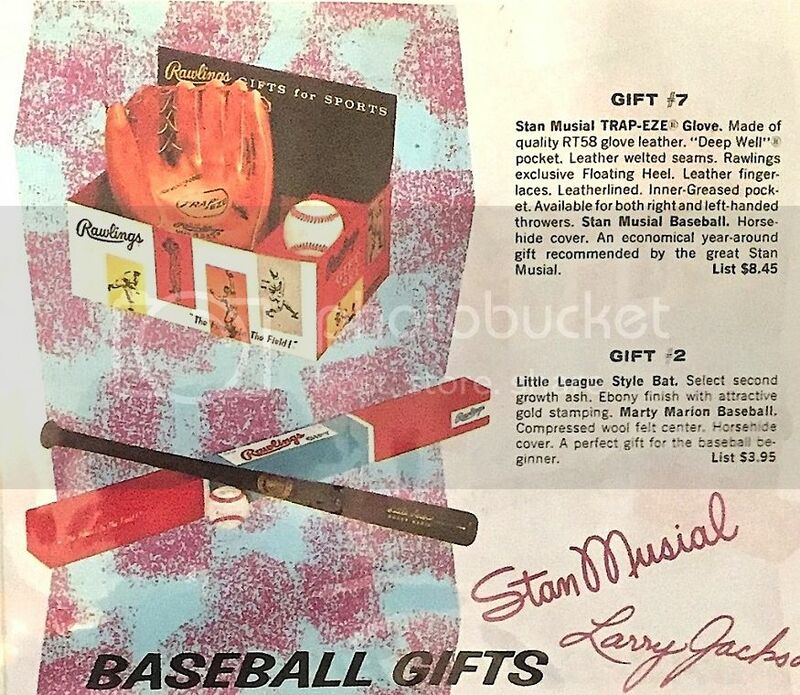 This is from JD's glove catalog library site http://www.baseballglovecollector.com Never a dull moment going through those catalogs for gems like this. 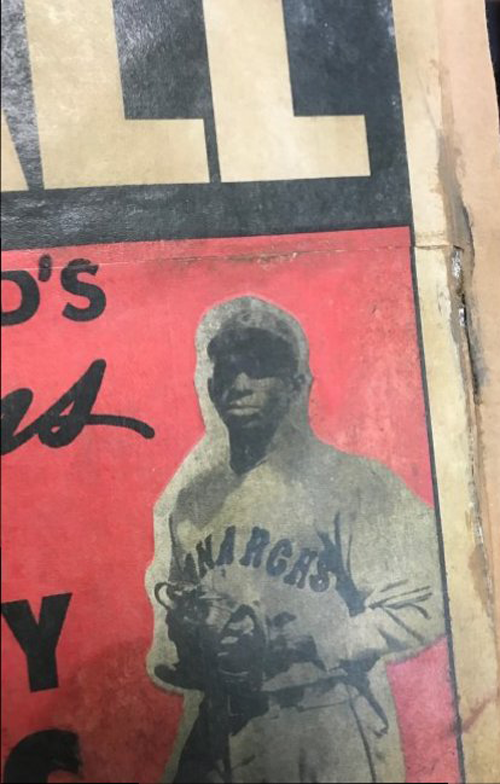 Below is a rare, early D&M ad from 1920 showing the G41 glove in transition from the "Hans Wagner" model to other stars of the day. 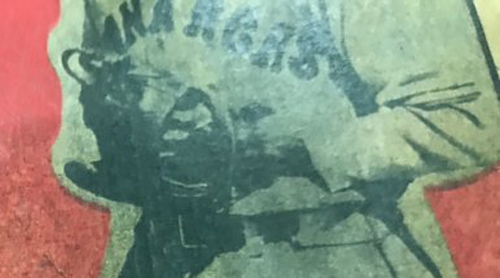 Charles Hollocher and Ray Chapman are mentioned among others. 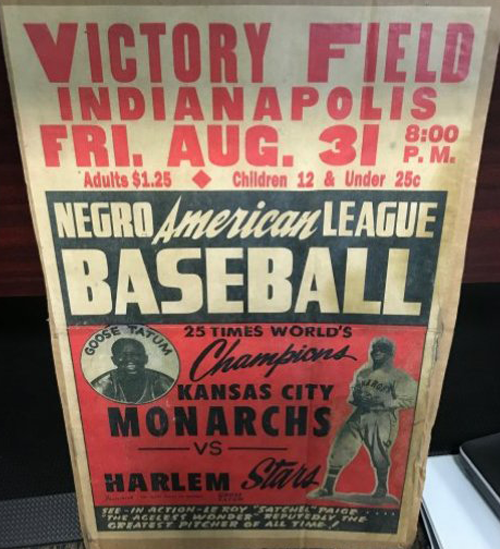 Joe Philips generously sent me a binder of various ads and historical articles. This is one of the neater D&M ads. I like the homemade quality of it. 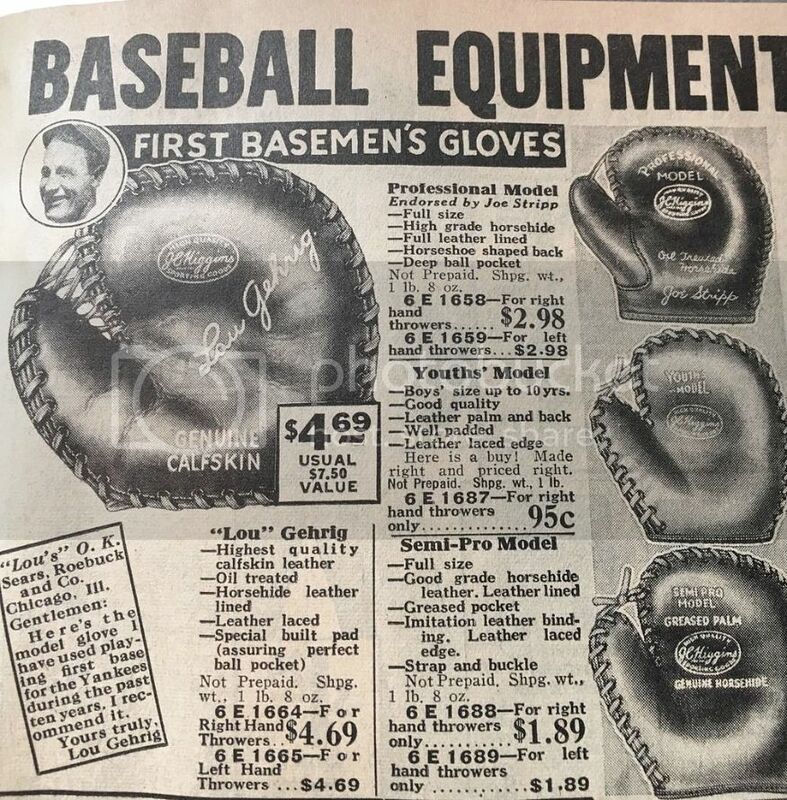 Joe sent over a cool Rawlings ad from 1965. I've never seen the gift boxes before. 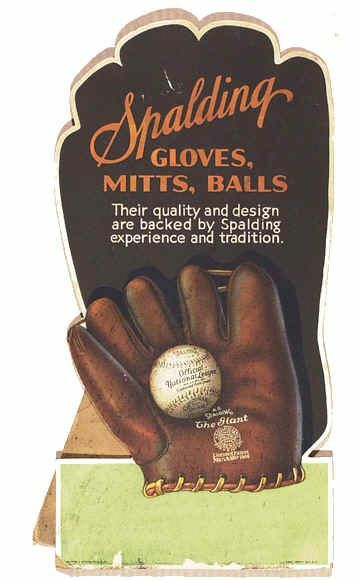 I have a photo of Dizzy Dean wearing one of these Spalding Giants. 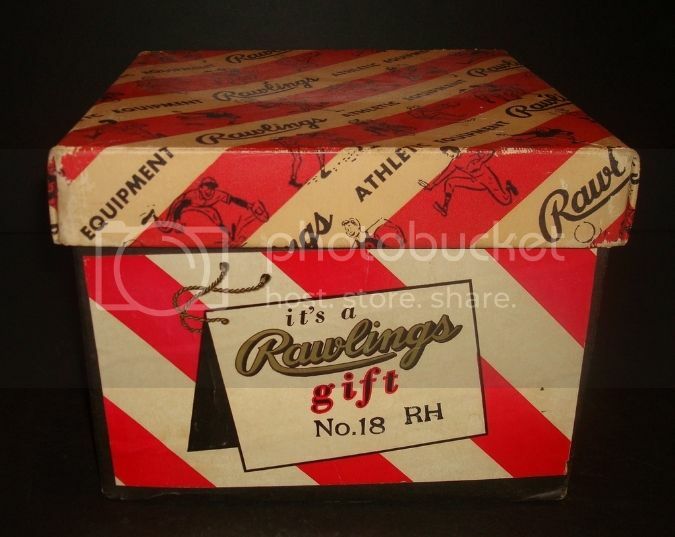 A cool 1968 Rawlings 70th anniversary ad. Great variety of web styles and pocket lacing. Rawlings really at the top of their game. Below is a 1935 ad for a Reach "Jimmie Foxx" model 3BB. It was top of the line in its day. There are a lot of Spalding/Globe examples out there but I've never seen a Reach version. It has the telltale pinky lace. I didn't realize a unique wrist strap was used on the Foxx model. All the previous year catalogs show only the face of the mitt in the ad. The 1935 ad shows front and back. 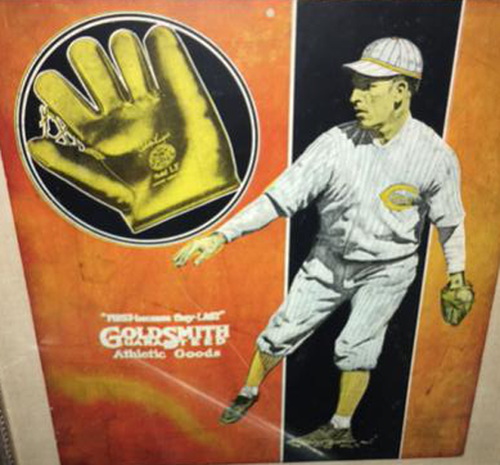 Below is an example of the unique wrist strap patented by Reach circa 1930.
mikesglove wrote: Before the Rawlings "Bill Doak" glove came the Goldsmith "Wilbur Cooper" model SF. An ad below from 1922 shows a Goldsmith model not yet surfaced in the hobby. The model SF was made for only one year with the Doak style trap webbing. By 1924 the model SF sported the tunnel loop web. 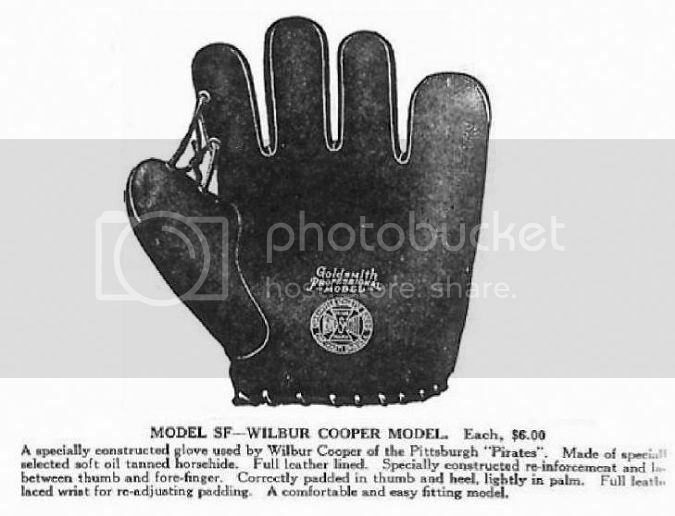 The "Adoph Luque" glove also shared the same model number as the Wilbur Cooper glove in 1922-23. This one has not surfaced in the hobby. By 1924 the new Goldsmith tunnel loop patent was incorporated into the "Luque" model. I thought this broadside was cool, too. The glove looks early 1930s with triple tunnel webs to me. I always think Goldsmith when I see one like that, but obviously I've been wrong before. Nice full page Sonnett ad from 1960. Brett doesn't have any of these models. Man, he has to get on it! The Billy Martin glove with the trapeze style web is cool. Believe me, Mike, I'm looking! I think I have that Billy Martin model though - I'll look later today.